KIEV, Ukraine -- Ukraine said hundreds of prisoners held by pro-Russia rebels had been released since the start of a cease-fire that appeared to be holding despite a weekend flare-up of shelling near two cities. 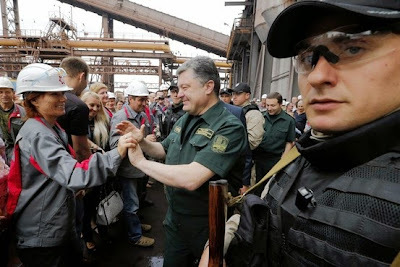 Ukraine President Petro Poroshenko greets factory workers during a visit on Monday to the port city of Mariupol, the scene of weekend fighting. European Union governments went ahead and approved a new round of economic sanctions against Russia on Monday. But EU officials said the measures wouldn't take effect for several days, at least, while they watch to see how the peace process progresses. Russian Prime Minister Dmitry Medvedev had said earlier that his country could retaliate for the new sanctions by banning foreign airlines from flying over its vast territory. Many American and European carriers fly over Siberia to reach destinations in Asia. Ukraine's President Petro Poroshenko said initially that more than 1,200 Ukrainian prisoners had been released in the last four days. But his spokesman, Svyatoslav Tsegolko, later said that 648 prisoners had been released so far. Another group of more than 500 was set to be released, he said, without giving a timeframe. The Ukrainian government's security spokesman, Col. Andriy Lysenko, said the area most at risk for continued violations of the cease-fire was Donetsk airport, the only part of that major city held by government forces. The Donetsk city council said Monday that residents had reported hearing sounds of shelling but there were no reports of casualties. Officials in the city, the scene of much of the recent fighting, said public transportation should resume on Tuesday. Mr. Poroshenko made a surprise visit to the other city where violence broke out over the weekend—the port of Mariupol, which is the largest city in the region still under government control. One woman was reported killed and three others injured there over the weekend. The president accused the rebels of trying to intimidate him by firing at a roadblock before his arrival Monday. "They thought they could scare [me]. No one is afraid of them," he said on his Twitter feed. "Mariupol is Ukraine. We won't surrender this land to anyone." Along with the cease-fire, initial steps under the 12-point peace plan signed Friday included a prisoner exchange. Col. Lysenko declined to provide a number for people detained by Kiev in connection with the five-month-old conflict. One separatist leader, Andrei Purgin of the self-proclaimed People's Republic of Donetsk, told the Interfax news agency earlier that the two sides would exchange 700 prisoners each, without specifying exactly when. Other details of the peace deal, including how much autonomy rebel-held areas in the Donetsk and Luhansk region will gain, remain murky. Mr. Poroshenko's negotiating position had been weakened in the past few weeks after what Western officials described as a Russian incursion crossed the border to support the rebels, helping reverse months of gains by Kiev's forces on the battlefield and leaving them on the brink of defeat. At a meeting in Brussels, European Union ambassadors approved plans for a modest expansion of sanctions. But Herman Van Rompuy, president of the European Council, said they wouldn't go into effect on Tuesday, as originally expected. "This will leave time for an assessment of the implementation of the cease-fire agreement and the peace plan," he said. "Depending on the situation on the ground, the EU stands ready to review the agreed sanctions in whole or in part." Some nations, led by Finland, wanted to hold back on implementing new sanctions while talks are under way. Finnish Prime Minister Alexander Stubb, whose country shares a long border with Russia, said in Helsinki that he was concerned about the indirect impact of sanctions and "the potential counter-sanctions by Russia." The EU sanctions would add three Russian state-owned oil companies to those facing restrictions on raising money in the bloc's capital markets, according to documents seen by The Wall Street Journal. Gazpromneft, the oil-production and refining subsidiary of OAO Gazprom ; oil transportation company Transneft; and oil giant OAO Rosneft—would be forbidden from raising funds of longer than 30-days' maturity. Five state-controlled banks, including Sberbank and VTB Bank, already barred from raising funds for longer than 90 days under the July sanctions, will also have the maximum maturity cut to 30 days. European leaders have said the new measures could be lifted if there is evidence Moscow is helping to forge a genuine political solution. "We all have to watch very carefully and be certain of what developments are taking place," Catherine Ashton, the EU foreign policy chief, said at a news conference in Ottawa with Canadian Foreign Minister John Baird. Medvedev said a ban on flights over Russia would bankrupt many airlines. "I just want our partners to understand this point," he said, in an interview with Vedomosti newspaper published on Monday. Russia has already banned imports of a range of U.S. and European foods in response to Western sanctions, imposed after its annexation of Crimea last March and the deepening crisis in Ukraine since then. In Kiev, Prime Minister Arseniy Yatsenyuk, a pro-Western economist who has been outspoken in his criticism of Russia in recent days, said the truce can't hold if Russia doesn't withdraw its forces. Russia has repeatedly denied sending troops and military aid to Ukraine. "For the real truce to take effect, there are three essential conditions: the first is no shooting. Second, Putin withdraws his mercenaries, his army, his equipment. And third, Ukraine restore full control over its state border," he told Ukrainian television. Rebel leaders, many of whom want full independence, have said that the issue of the ultimate legal status of their regions would be a matter for talks. Another separatist leader, Igor Plotnitsky, told Interfax that both the Donetsk and Luhansk People's Republics said they are prepared to compromise for the sake of a law on a "special status." According to the protocol signed Friday, Kiev will pass a law on "temporary self-rule in certain districts" of the two regions. That means the territories held by separatists should remain as part of Ukraine without giving them the right to veto Ukraine's integration with the EU, Yuriy Lutsenko, an adviser to Mr. Poroshenko, wrote in commentary for the Ukrainska Pravda website Sunday.